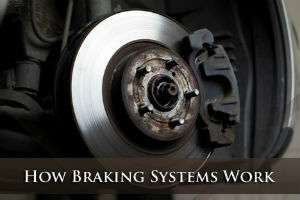 It’s no secret that your braking system is one of the most important features of your car. If your car doesn’t start, or won’t get moving, you might be stuck somewhere—but at least you’ll be safe. If your braking system starts to fail while you’re traveling at high speeds down a busy highway, you could be putting your life and the lives of others in jeopardy. To make matters worse, there’s rarely any kind of definitive sign that your brake system is no longer working effectively. Brake pads tend to wear down over time, so gradually you don’t even notice, until they’ve been reduced to far below “healthy” working capacity, putting them in need of auto repair. If you want to keep your car safe, and in top working condition, you need to learn to identify the warning signs that your brakes are in need of attention—proactively—and contact an auto repair center immediately. First, it’s important to know the basics of how a braking system actually works. The vast majority of vehicle brake systems use hydraulic brakes, which utilize a hydraulic system for amplified stopping power. When your foot presses down the brake pedal, it forces a non-compressible fluid through a hydraulic system, which forces pressure to individual disc-shaped brakes (in which calipers clamp a pad to individual rotors to slow momentum). These disc brakes press against your moving wheels, using friction to slow your momentum. Though there can be problems with your braking fluid and hydraulic system in general, these are much rarer than the normal wear and tear faced by disc brakes. Once these disc brakes reach a certain threshold of degradation, they become virtually ineffective at stopping your vehicle safely. 1. You see something wrong. There’s an easy way to gauge the health of your brake pads, and that’s visually—even if you aren’t a car expert, you should be able to draw a definitive conclusion. Take a flashlight and look through the spokes of your car’s wheels. You’ll see a circular brake pad pressed up against the rotor of each tire. Examine this pad for depth; a brake pad in healthy working condition should give you at least a quarter inch. If it looks worn down beyond that threshold, you’re in need of auto repair. 2. You hear something wrong. Nobody likes to hear a screeching sound, but it’s a sign that something’s wrong with your vehicle. In fact, there are a few different sounds that can clue you in to a braking problem. When you hear a high-pitched squeal every time you apply the brakes, it’s usually an indication that your brake pads have worn down and that metal is coming into contact with metal. If this is the case, you need to schedule an appointment with an auto repair center immediately. There is one exception to this, however; you may hear a squealing sound following periods of rain, as trapped water can produce a similar, yet innocuous noise. You only need to be concerned if you hear this noise consistently, and under dry conditions, but listen carefully—you may not be able to hear it over a loud radio or the noise from the road. 3. Your brakes are unresponsive. A lack of responsiveness could indicate a problem with your hydraulic system. 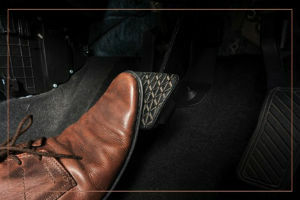 When you press your foot to the brake pedal, you should feel an immediate reduction in your vehicle’s speed. Even an extra fraction of a second could cost you significant stopping distance, so if you feel the need to stomp your foot all the way to the ground to get a reaction (or if there’s any kind of delay in effect), it could be a sign of braking system failure. Usually, this indicates a slight leak of the hydraulic fluid that’s responsible for transmitting the force of your foot to your brake pads, but this could also mean the internal hydraulics are in disrepair. 4. Your car pulls when you hit the brakes. If you find that your car pulls in a specific direction when you brake, it’s a sign that your brake pads aren’t wearing evenly. For example, let’s say you hit the brakes, but you feel the car “pulling” to the left to such a degree that you have to compensate by steering right. This would indicate that the brake pads on your left are in better condition than the brake pads on your right, making the sides of your vehicle disproportionate in stopping power and speed. If left unchecked, the problem will likely grow worse, so get all of your brake pads checked—and potentially replaced altogether. Brakes in good working order shouldn’t produce any vibrations or “grinding” feels. If you ever hear a grinding or growling noise, it probably means your brake pads are worn out completely. This can cause long-term damage to your rotors (or even ruin them), so try not to ever let your brakes get to this point. Similar to a grinding feel, you may experience vibrations when you attempt to bring your vehicle to a stop. If you do, it could indicate that your rotors are warped, or that your vehicle is out of alignment in some other way. Most of the signs referenced above are subjective and hard to notice. A friend might hear a squeaking noise when you don’t, or you may not notice any significant differences in the stopping power of your vehicle. In any case, you need to ensure your brakes are in top working order if you want to maximize your safety on the road. The best way to keep this delicate system in check is to schedule regular maintenance with an auto repair center, so feel free to give us a call with any questions at The Garage Auto Repair. Even just a few preventative maintenance checks a year can keep your car in peak working condition.